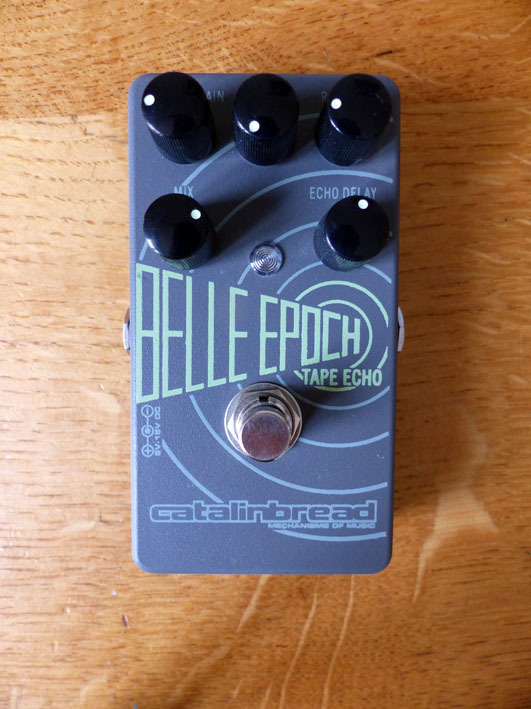 Belle Epoch, Delay/Echo/Phrase Sampler for Guitar from Catalinbread. MacB's review (This content has been automatically translated from French)"This was the time when the guitar sung, it was time amps screaming!" Delay pedal Echoplex type tape hypersensitive attacks on the strings of the instrument or by doights pick. This pedal is a digital delay but does not scan the guitar signal. It reproduces the delay time of 80ms famous EP3 perfect to play as Brian May or Jimmy Page, Gilmour, Greenwood, Johnny Marr, guitarist or a dark Krautrock! - Sway control the appearance of "floating on the strip"
- Tone control the "recording level" or force you "tap on the strip" for its light and airy or thick and saturated. It also adjusts the volume of the first rehearsal. 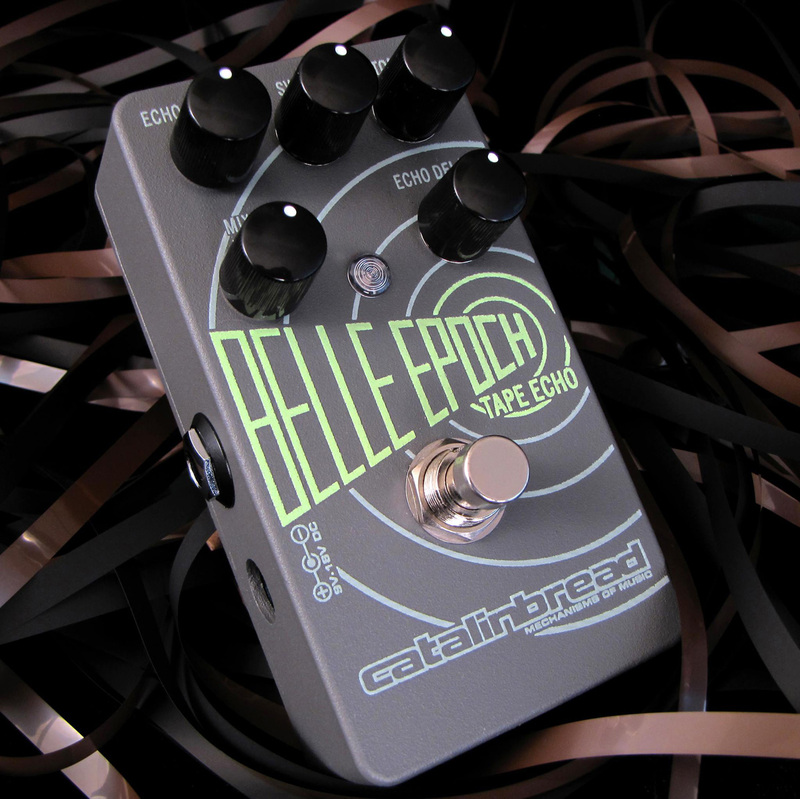 An internal gain control adjusts the gain and volume of the Belle Epoch up a boost fuzzy. An internal switch allows the switch to true bypass or "trails" mode. It can be powered by 9V or 18V for more dynamic. Say it with internet settings are easy to find, and the echoplex effect is simply all realistic, fantastic, it&#39;s like being possessed by David Gilmour or Jimmy Page, see THE EDGE U2 in the 80s, to the time of the album Unforgettable fire or Johnny GREENWOOD, period OK COMPUTER / KIDEA with RADIOHEAD. This is 10 times better than MEMORY MAN is the equivalent of 2 or 4 memory man 70 year, connected in series 3 amps, but that goes with the breath in terms of power. This is all simply fabulous, where the sound appears as packed with the modern MEMORY MAN, here it is now released with it. Finally it will remain poorer than a large machine in EMPRESS hair, but it is a delay professional to get professional effects in my opinion, to create a special sound atmosphere planing. It can be used on stage all is possible here, and a lot of kind! For my part, I use 18-volt plug directly into an old fender 60s, the effect is all simply great, it feels at 18 volts, the effect is completely stereo, all being warm and atmospheric. 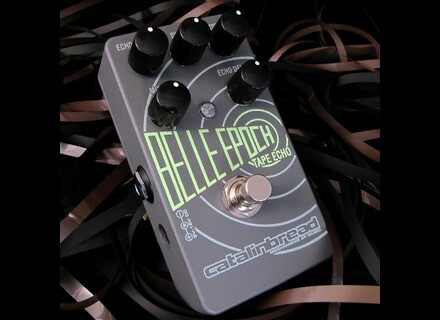 It is used in Mode "buffer" (via switch inside the pedal which allows a true bypass coupled with a real buffer that will boost its your very slightly). It can also use 9 volts, but the effect seems more dull I think. To use, I recommend the one hand never exceeded 9:00 at the MIX pedal (unless you want to spit out your breakfast, or you feel like rolling in sinuous curves mountain!) And never exceeded 13.00 at the ECHO / DELAY function, because the effect becomes quite unmanageable unless you&#39;re a musician, experimental guitarist. For the rest of you do as you wish. The effects are very effective, it is both in the progressive rock of the 60/70 with Led Zeppelin and Pink Floyd, rock or "new wave" of the 80s, especially with U2, in the British 90s rock / 2000 with Smith, Johnny MARR, RADIOHEAD, KASABIAN (early) or more experimental things like KRAUTROCK (Mogwai, Faust ...). One can even get the effect of slapback that can be found on the rock&#39;n&#39;roll album of John Lennon, it is the same! To me this is clearly not the delay to music or another in particular (eg this is not the delay for U2, however depending on your hardware you may reproduce this characteristic sound come) this will depend on your guitar, your amp, because delay in the faculty not to distort the sound of your amp or guitar, it does not stain as could a MEMORY MAN. I use it with a Fender Mustang made in Japan, with a custom luthier shop system, standard type L 1965 plugged into a Fender blackface. I do not use nothing else for the moment, because I&#39;m on a kind folk / rock, I&#39;m not progressive rock. However it merges well with FUZZ (BIG MUFF), overdrive (TC ELECTRONIC, FULLTONE), the boost (Xotic, MXR). It is very sensitive to the ties between the pedals, if the clip is bad qualitée, you lose the signal, you will feel when you désenclencherez the delay. I use it for 1 month. Before that I had MEMORY MAN, IBANEZ, MXR Carbon Copy delay. It dominates them all by far! Only a delay of at EMPRESS, more expensive, higher-end, can make a difference and be even better (for trying), but after that is not the same world, and not the same price. The price / quality ratio is very correct for this type of machine. + = + Strength, beautiful design, solid, nice nod to the old EP3 design. + Interragie immediately with shots or pick doights guitarist. - = - 9 volt plug in, the effect is great but much duller than 18 volts it feels. I would advise the 9 volt fans Slapback, country, blues! - You can not put any 9 volt battery, or more, it connects with an external power supply (to buy more at the time of purchase, focusing on BOSS, VISUAL SOUND or DUNLOP brands, other brands KORG , STAGG, will not work with this pedal!). I put this negative point, but for my part, I never use batteries of sorts for no no my pedals! Yes I do it again this purchase, or I will consider a delay of at EMPRESS, even better than this one. 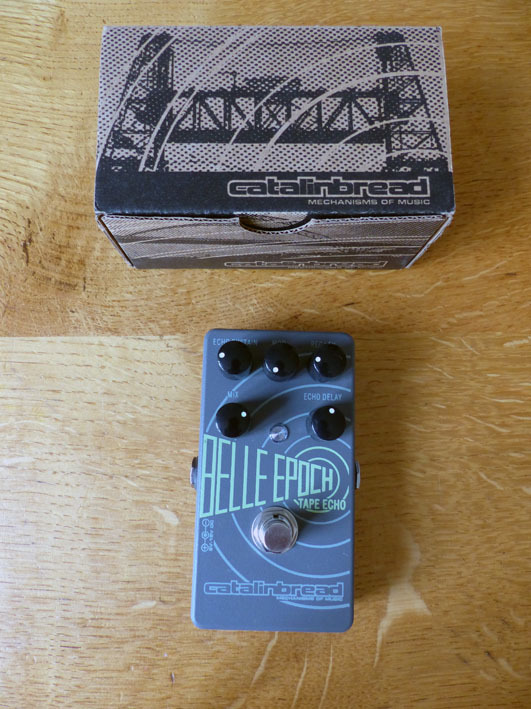 props's review (This content has been automatically translated from French)" The belle époque"
- This is a delay pedal supposed to emulate the Echoplex EP3 tape, popularized by Jimmy Page and Brian May, with all its faults. - Operation of 9 to 18V. - The treatment effect is digital but the dry signal remains analog. - 5 pots (whose names are not constant) was a "sustain" that will manage the number of repetitions to self-oscillation, a "mix" that everyone will understand its usefulness, a "delay "determining the duration of repetitions from 80 to 800ms. Now talking about the last two: the "mod" will create a regular stall simulating imperfect rotation of the band, subtly or bluntly honest. the "rec level" (or "tone") will allow him to control the amount of signal injected into effect, but in a nonlinear manner completely, and interaction with other controls. - A trimpot for adjusting the output level, because it can also serve as a booster! No tap tempo, no location stack, no memory setting, you can not have everything. The case is compact and lightweight, the "powder coat" very solid coating. Simple configuration but it can be nice to take the time to adjust the trim boost to his liking. It should also experiment with different placements in the effects chain. It goes very well before such an overdrive or front amp. 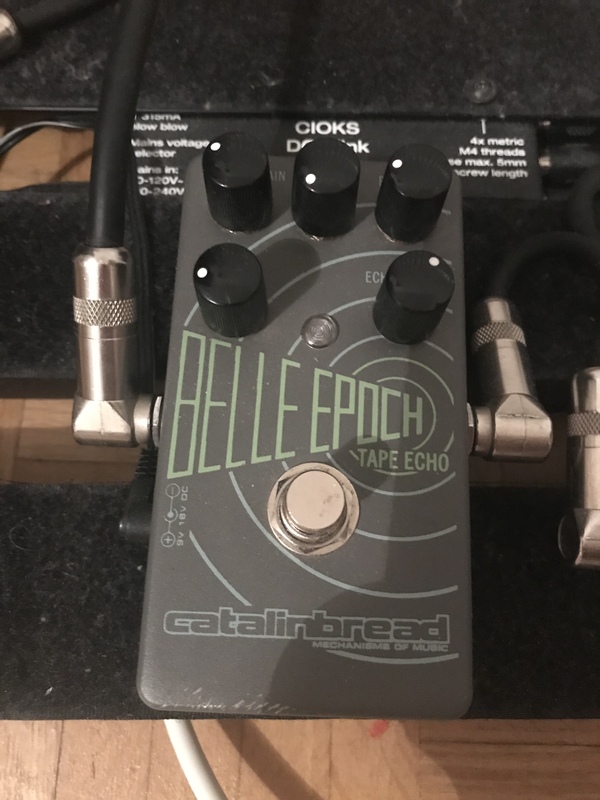 This feature is explained in the doc: "The Belle Epoch WAS designed to be run in front of your amp in the same way the Echoplex WAS designed to be run in front of your amp They share input and output Almost identiques Circuit topologies, Including. unbuffered passive mixer system of the EP-3. HOWEVER, we tuned it to-have a lower output impedance than the EP-3 to not load down the output as much while still Retaining the open non-buffered output the interface. " The tiny tornado slapback to the infinite, it's just beautiful, 10/10. A delay say "classic" (4 or 5 repetitions of 400ms), this is the famous setting of "mod" makes the difference: it adds a slight detune the blend between the direct sound and repetition, think of some whammisées notes refrain (What's this?) Paranoid Android. on the other hand is better when you do not put too much (9-10h max). I had some delays in my hands, but never one that can produce this "flutter" so if music. It is on the tape echo simulation, each repetition inevitably degrades compared to the previous, but this degradation does not occur in the same way depending on the setting of the knob "rec". In the amount, we will make the first rehearsals franker, more aggressive, must be balanced with the "mix" after overdrive we will even bring out the saturation in the repeated sound. Must be dosed sparingly. Perfect for the post Neil Young atomic. If the sustain you go, we will go into the world of self-oscillating. The border reached to 2/3 of knob. We will be able to play simultaneously on all other pots to change the texture in real time. Details in activated mode, it will be possible a chord repeating to infinity, switch to the bypass and play a solo. We will be able to make the way the final Karma Police (them again!) Increasing the time. At high dose, the "rec" will allow more or less crushed previous repetitions depending on the intensity of the game good with me and my big paws it gives especially porridge, I unfortunately do not have the talent 'exploit its full potential, but a very good musician could leave Wonderland. Amateurs own delays, precise and clinical, continue your way! Here is done in the dirty, which-derails, not transparent or uncontrollable if you go too far! 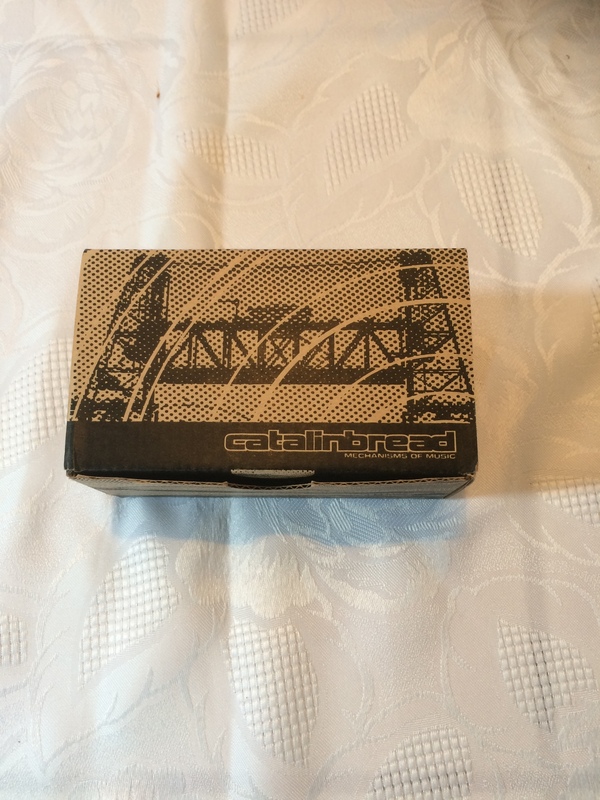 Catalinbread had-apparently one watchword, reproduce imperfect perfection. Not knowing the true EP3, I will not judge the fidelity compared to the original. In any case this is a delay very "musical" (although it does not mean anything), including standard use. I did that for 2 months, I have not yet tested in all situations (I actually wanted to be the first to post a review on AF! ), I think you could spend days and nights of experimentation. In any case I do not want yet to hear anything else. Only his sister Echorec might later have through my eyes. I can only regret the absence of tap-tempo.